A new ex-voto that I've recently 'antiqued', scanned, colour-corrected and all that other guff (dated 1st of December, 2009). I had to break a rule with this one. Usually, if I'm planning on painting an ex-voto, I'll only give myself a couple of days from the event to complete it, otherwise its intensity and time of possibly existing passes, so it should disappear into the ether with all the other events in my life that I decide not to document. I had a back-log of important ex-votos to complete and since we've been travelling around NZ a lot, I felt I could let this one pass as the whole 'teeth' issue comes up a lot in this ongoing series. 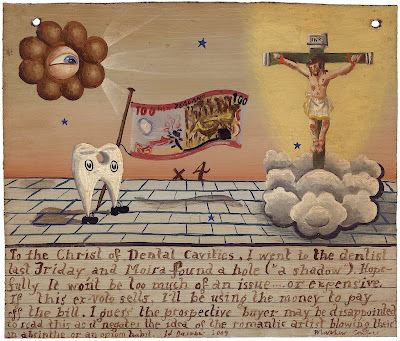 I completed another tooth ex-voto once got back from Wellington last week, in regards to the recent filling I received. It's the first filling I've had since I was 17.